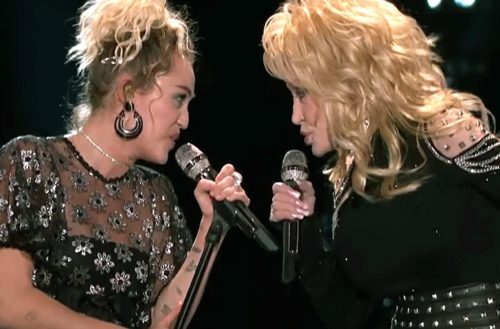 One of the coolest things about Miley Cyrus is the fact that her godmother is Dolly Parton. The two are quite close. They have collaborated in the past (covering Jolene together), but we’re really excited that their next collaboration is actually new music. Cyrus released the track list for her new album Younger Now – and featured on that list is a song titled “Rainbowland” that features Dolly Parton. Parton was vocal about accepting her goddaughter through her Bangerz era, a time when many people criticized Cyrus and her open embrace of drugs and partying. This isn’t the first millennial pop princess to feature the country queen on a track this year. Kesha’s new album Rainbow featured the track “Old Flames Can’t Hold a Candle to You” with Parton serving some fierce vocals. Parton is about to release new music soon herself… only it’s not for adults. Miley Cyrus releases Younger Now on September 29.